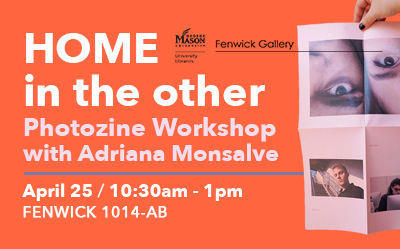 As part of the Mason Libraries Artist-in-Residence Program, visiting artist Adriana Monsalve will lead a photozine workshop open to all Mason students, faculty, and staff. Register for “Home in the Other” workshop now! George Mason University Libraries are excited to announce a new venture: the Mason Libraries Artist-in-Residence Program! For our first (pilot) year, we’ve invited Adriana Monsalve, a photobook artist and publisher, to join us in a research and visual arts project. Throughout April and May 2019, Monsalve will divide her residency between the University Libraries (Fenwick Library, Special Collections Research Center, and Fenwick Gallery) and the Mason School of Art to lead a series of in-class lectures and workshops, and to conduct research in the library’s photobook and artists’ book collections. The residency will conclude with an exhibition curated by Monsalve and an artist’s talk, and in the publication of a collaborative zine produced by Mason students and faculty. Learn more about Adriana Monsalve and event details at http://fenwickgallery.gmu.edu/residency. 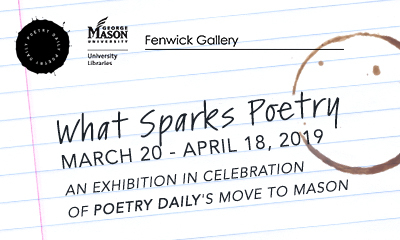 Fenwick Gallery at George Mason University is pleased to host “What Sparks Poetry,” an exhibition in celebration of Poetry Daily. The exhibition will be on view from March 20 through April 18, 2019, with a panel discussion presented by members of the Poetry Daily editorial and publication team on Thursday, March 21 at 6:45pm. This event immediately precedes the Visiting Writers series talk with poet Ilya Kaminsky at 7:30pm in the Fenwick Library Reading Room. Learn more about Poetry Daily and “What Sparks Poetry” on our exhibitions page. What is a landscape? A scenic countryside? A long-standing tradition in art history? The distant backdrop of our lives and memories? In the exhibition [Land]scape, artists ask us to engage the notion of landscape on multiple levels. 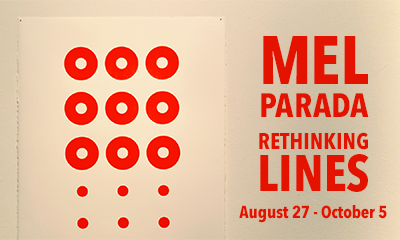 Featuring a range of painting, mixed media, printmaking, sculpture, and video works, the exhibition itself becomes a landscape revealing a strata of emerging art practices within Mason’s Visual Arts MFA program. Presented by Fenwick Gallery in partnership with ARTIFACT, a graduate student organization for MFA candidates in Mason’s School of Art. Read more on the Fenwick Gallery exhibitions page. Reminder! Join us this Wednesday, September 26 at 11am for a discussion with Mel Parada, in conversation with Emily Fussner (Fenwick Gallery GPA). This artist’s talk will be held in the Fenwick Main Reading Room (2001) on the second floor of Fenwick Library. Visitor parking is available in the Rappahannock River or Mason Pond parking decks — see the Fairfax campus parking map for more details.